Epworth Building: Gothic Icon Gets a Colourful Revival | Adelaide Tours | Discover Adelaide's secrets, mysteries and treasures with our guided adventures. You might like our Hidden Stories, Small Details walk! The gothic former HQ of the Methodist Church is now the unlikely home of a new wave of quirky Adelaide creatives. Looming large over Pirie Street since 1927, the Epworth Building is now enjoying a new life. Under-utilised heritage buildings stick out like a sore thumb – or perhaps a disapproving wag of Colonel Light’s forever-outstretched finger. Looming titans of yesteryear like Gawler Chambers on North Terrace figure large in our public consciousness, but it’s easy to miss the ones that actually keep giving. Recently we’ve seen once-neglected sites like the former Westpac Bank and Electra House revived by our burgeoning foodie and hospitality culture, but there are others that provide a stealthier contribution to the city’s modern identity. A striking bit of 1920s gothic revival architecture, Pirie Street’s Epworth Building is one site being given new legs by a wave of tenants, with a particularly strong contingent of young, local creatives. Don’t let the gothic arches and muted palette fool you, it’s home to hotbed of colour and experimentation. Completed in 1927, the building is a conspicuous reminder of the influence of the Methodist Church on South Australia’s early colonial history. The Church embarked on the project to accommodate their growing community needs, and earn some cash from the real estate next door to the Pirie Street Methodist Church (built 1852). The building’s austere but reverent lines and striking stained-glass foyer windows are a visible hangover of these religious ties – even the name is a hat tip the North Lincolnshire town of Methodism founder John Wesley’s birth. That’s devotion! 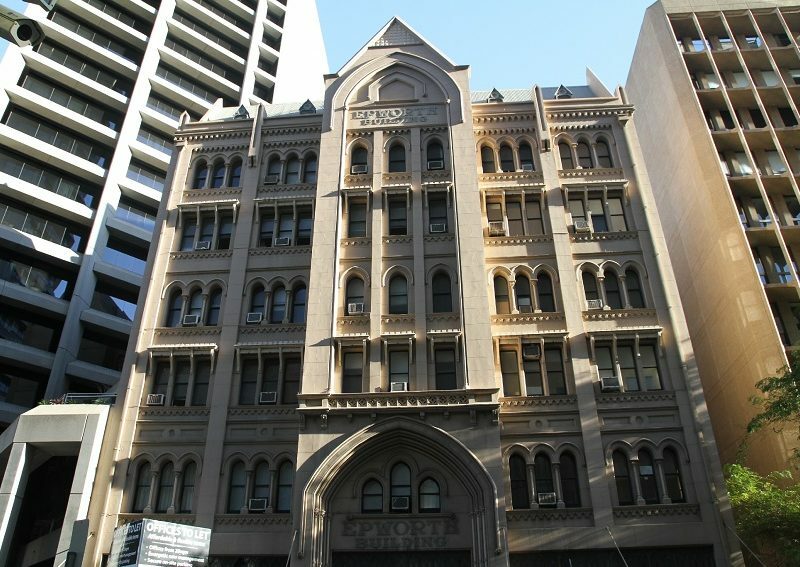 Designed by G.K. Soward, the gothically inclined architect and one-time MP behind Beehive Corner, the six story “high rise” was among the city’s tallest buildings when completed, and attracted an eclectic clientele from high-end lawyers to music teachers as well as church operations and its long-running Book Depot. But like any living city, Adelaide changed, and by the late 20th century many of the churches that gave rise to its infamous nickname had disappeared. One such casualty was the Pirie Street Methodist Church, which now found itself at the heart of Adelaide’s business district. Its days were numbered, and in 1976 the bulldozers arrived to make way for new Council facilities. Just a few decades later, the Epworth Building shook off the last of its church connections when the Uniting Church sold it in 2003. The building spent the next decade changing hands and finding its feet, but now a cluster of creative businesses are finding new inspiration from their auspicious surroundings. Launched in May, Renew Adelaide brought together a handful of talented and industrious fashion creatives who left the nests of their home workshops and studios to set up shop in the building. In a street-facing corner of the first floor Epworth Studios sees artists and fashion industry workers including Kate Anderson (SIG The Label), Stacey Hendrickson (AZALEA Models) and Sylvy Earl work side by side. As artist and fashion designer Julie White explains, being able to work in such a building was an unexpected boon to her growing business. White and co. are just the tip of the creative iceberg currently holed up in the building. Upstairs, Cloister Workrooms continue the fashion trend with bold and experimental works. Neighbours Dinosaur are the nostalgic, pop culture loving filmmakers behind wonderfully weird cult SBS cult comedy Danger 5 and the ‘00s viral web parody Italian Spiderman. Further up are creative media start up Sundae Social Co, a trio of writers and media producers who have teamed up to provide social media management to operations like the Adelaide Film Festival and LA-based Fitness in Post. It’s one example of how older buildings can continue to contribute to a city. 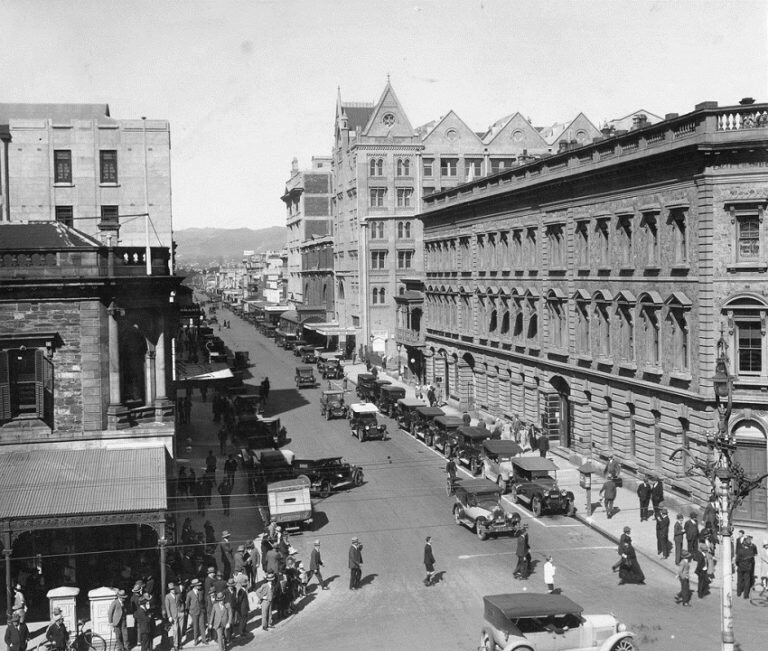 The Epworth Building is featured in Hidden Stories, Small Details, part of the new Adelaide Tours guided walks program uncovering surprising tales and secret stories around Adelaide.